1. Suitable for use on all freon service applications. 2. Field include: refrigerating units, compressors etc. 3. 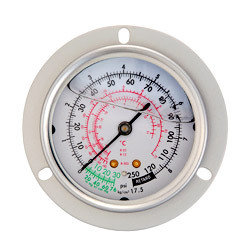 Pressure range: -30 in hg ~500 psi, 76 cm hg~35kg/cm-30in hg~500psi 76cm hg~35kg/cm². 4. Operating temperature: operating temperature. 5. Connections: brass alloy, radial or center back mounting. 7. Radial connect: 1/8’’ npt. 8. Center back: 7/16’’ unf. 9. Sensing element: bourdong tube, brass alloy,≦70kg/cm-30in. hg~500psi, 76cm hg~35kg/cm² (bar) coil. 11. Dial: aluminium in white & lettering in black. 12. Pointer: aluminium in black. 13. Case dry case: Painted stainless steel or abs plastic, colour coded, blue for low pressure and red for high pressure. 14. Fluid filled: Aisi 304. 15. Upper ring: lbm/cbm: aisi 304 Lm: pc. (2) Front or rear flang. (3) Extemal adjustable red mark pointer (max. Or set pointer).